Good Luck Messages for New Job: If you know someone who has got a new job, send your best wishes to mark the new beginning. Whether it is your friend, old colleague, ex-boss or someone else you know, write a sweet note to let them know that you wish nothing but the best for them. Cute texts, inspirational quotes, funny tweets or congratulatory Facebook posts – do whatever it takes to motivate people who are on the brink of a life-changing career move. 1) Opportunities may come to people who are at the right place at the right time. 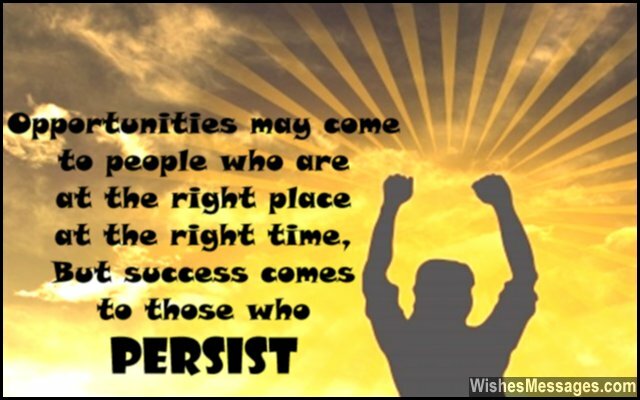 But success comes to people who persist. Good luck. 2) Motivate others, don’t cut corners. Try not to be rude, carry a positive attitude. Use your brains, not your brawns. Depend on hard work, not just sheer luck. 3) Whether it is new projects, team meetings or promotion, always aim to give 100% commitment and devotion. Good luck. 4) Good luck dealing with dirty office politics, manipulative colleagues and nasty office gossip that hits you where it hurts. Apart from this, I hope you enjoy your new job. 5) Your new job is a test, in which I hope you do your best. Just enjoy and don’t stress, hard work will yield success. 6) Don’t worry about deadlines, don’t worry about meetings, don’t worry about promotions, don’t worry about late evenings. Don’t worry about nasty colleagues, don’t worry about having a nasty boss… just enjoy your new job and let your worries go for a toss. Good luck. 7) Your new job is a blank canvas and a masterpiece in the making. All you have to do use your skills, knowledge and experience to turn it into an inspirational work of art. Good luck. 8) Success at a new job hinges on how well you can use the experience of your previous one. Good luck. 9) Don’t be bound by how much you are paid in your job. Work as if you are being paid millions, and you will open up doors to endless possibilities. Good luck. 10) Be nice to your new colleagues, but don’t forget to keep in touch with your old ones. Learn as many new things you can in your new job, but don’t forget what you learned in your old one. Good luck. 11) Life has dealt you a good hand… make the most of it. Good luck with your new job. 12) I hope that your new job brings in the sweetest success, biggest promotions and the highest laurels. Good luck. 13) Always remember that even when your luck runs out, your skills and experience will always bail you out. 14) I can wish you all the luck in the world, but it is useless if you forget that your destiny is under your control and no one else’s. Good luck. 15) Luck has already played its part in getting you a new job. Now it’s all up to you. 16) Luck is like a fashion trend, it comes and goes. 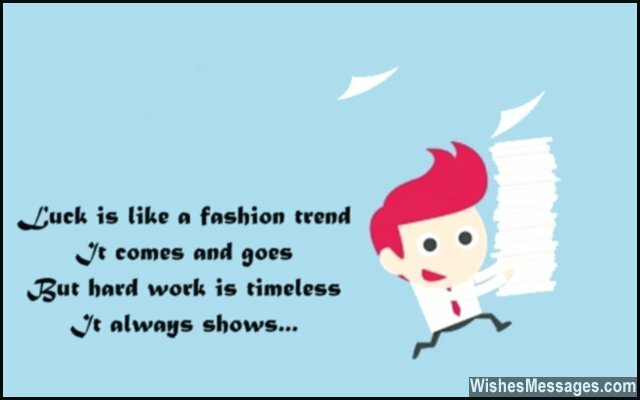 But hard work is timeless, it always shows. 17) Go-getters like you never need luck by their side, because they have determination and hard work in their strides. 18) Forget the cliché wishes about promotions and success. I just hope that the after office drinks at your new workplace are nothing but awesome. Good luck. 19) Looking at the amazing new job that you have got, it seems that you already have all the luck in the world. Do you mind passing some of it to me? 20) Your new job presents a whole new range of opportunities including new colleagues to gossip about, new interns to make fun of, new bosses to curse and new company rules to break. Have fun and good luck. 22) Being lucky is all about the attitude you carry. If you stop relying on luck… you won’t need it at all. 23) The fact that you competed with hundred other applicants and bagged your new job speaks volumes about your merit. Good luck, although people with merit already have luck by their side. 24) I hope your new job brings you as much happiness as the amount of effort and hard work you put into it. Good luck in making your job enjoyable and productive at the same time. 25) As long as you are brave, luck will be by your side. And even during the moments when it isn’t, your braveness will help you find a way out. Be brave, good luck for your new job. 26) From working for a good company to taking a career leap into a better one, you have poised yourself for greater heights. I wish you the best. 27) Just work hard and focus on your job… because luck truly favors the prepared. 28) I doubt that you need any luck but I’m sure that your new colleagues need heaps of it to deal with someone as crazy as you. Please give my best wishes to them. 29) Like you, people with perseverance, dedication, commitment, determination, fortitude and resilience rarely need to be wished good luck when they take on new endeavors. That is because they make their own luck wherever they go. 30) You were one of the best employees in your previous job. I hope you carry on your legacy in your next job too. Good luck and have a good time. 31) Wherever you go, there will always be people who will try to put you down. 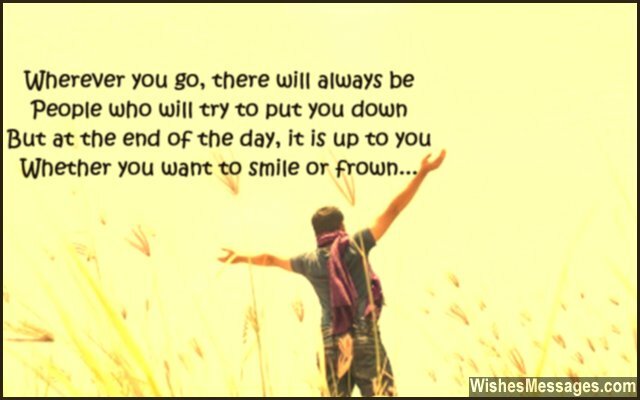 But at the end of the day, it is up to you whether you want to smile or frown. Good luck. 32) You can get yourself a university degree by studying hard. You can learn a new professional skill by getting on the job experience. You can get a promotion by performing well in a job. But there is one thing that you cannot get unless someone gives it to you – luck, for which you have friends like me! Wish you good luck for your new job. 33) A new job means new friends, new experiences, new mentors, new perks and new problems. Good luck in welcoming a new phase of your life. 34) Your new job may be a game changer for your career, but it will be a life-changing experience for all the new colleagues who you will empower with your knowledge and expertise. Good luck. 35) I hope that along with your commitment and determination, you leap ahead by taking the best decisions. I hope that with your zeal and hard work, you secure lots of promotions and perks. Good luck. 36) Knowing the kind of hard worker that you are, I know you will go far. Good luck. 37) Just remember that jobs, deadlines and projects will come and go, but the relationships you forge at work have the potential to turn into lifelong friendships. Have fun and enjoy your new job. 38) As you begin your new job, just remember that even the smallest of achievements can have the biggest of impacts on your life. Good luck. 39) Don’t think of yourself as a newbie on the new job. Always remember that you have been hired because the company saw you as a value addition to their team. Good luck. 40) Your company has hit the jackpot by getting an employee as hard working, dedicated and committed as yourself. Use your new job as a platform to propel yourself higher and hit the jackpot of your career. Good luck.